For much of the past two seasons, the Los Angeles Angels have seen their pitching staff decimated by injuries. But the Angels may finally be starting to get healthy in time for the stretch run. 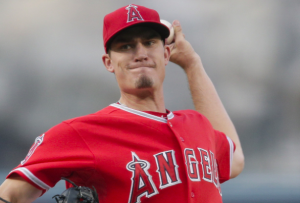 The team announced Wednesday that lefty starter Andrew Heaney is ready to return from Tommy John surgery. He will make his season debut Friday when the Angels begin a series with the Baltimore Orioles. Heaney is just 26 and has a mere 26 big league starts under his belt. But he could be a huge key for the Angels during their playoff push. The lefty made 18 starts for the Angels in 2015, posting a 3.49 ERA and emerging as a key part of the Los Angeles rotation. However, Heaney made just one start in 2016 before being sidelined with an elbow injury that required Tommy John surgery. Nearly 14 months after the surgery, Heaney is ready to get back on a big league mound. He made six minor league rehab starts, accumulating 27.2 innings and posting a 2.60 ERA over that span. Naturally, there is some trepidation about returning from major surgery. But Heaney had no setbacks during the rehab process, and so the Angels are confident he’s ready. The Angels are still without starting pitchers Garrett Richards, Nick Tropeano, Matt Shoemaker, and Alex Meyer. But they are getting Heaney back Friday and got Tyler Skaggs back from injury earlier this month. Skaggs has pitched well in three starts since coming back, posting a 2.93 ERA in three starts. Heaney and Skaggs now have a chance to give the Angels a significant boost heading down the stretch. Meanwhile, Heaney is trying to manage expectations and not put too much pressure on himself to be a savior for the Angels this season. The Angels are currently holding a slim lead for the second wild card spot. However, there are currently six teams within two games of them, creating a crowded race heading down the stretch. But with Skaggs back, Heaney returning Friday, and Richards potentially returning before the end of the season, the Angels have to feel good about their chances. Of course, there are no guarantees that Heaney will come back and immediately be the same pitcher he was before the surgery. But he and Skaggs could join Parker Bridwell in forming a rotation that can help lead the Angels to the postseason.